You never know when they’ll pass you by. You may remember me as the American in the red jacket, or perhaps as the girl with the unmistakable air of lunacy about her. I can assure you that I am, most of the time, actually pretty sane. I am also, on occasion, able to form complete sentences and even string them together into what could be considered a conversation. I apologise, I don’t know what got into me – I think it may have been early stages of frostbite! 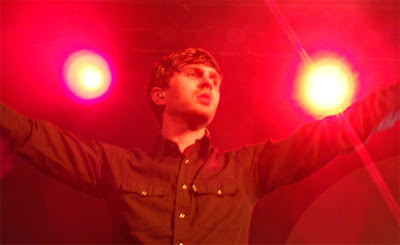 In May of 2005 my friend and I made the 5-hour trip across from Cleveland to Chicago to see you play live. The finer details of the evening are mostly lost, having been eclipsed by what happened after, but I do remember that you were bang on form and I was very glad we’d come. Sometime during your set (and I don’t know why, which makes the story even more compelling, perhaps the lack of a why is the real moral…) and completely out of the blue I was overcome with a need to call my grandmother. Something in your voice or in the lyrics to the songs… Whatever it was, whatever the why, the songs you were playing compelled me to action. Which song was it? I can’t say. Maybe “Wires”, although I like to think my subconscious mind is a little less obvious. My most likely guess is “Chances”. Either way, after you finished your set, off I went to the lobby to call my grandmother. The contents of our (quite lengthy) conversation are mostly personal, but we said we loved each other and to take care and, most importantly, we ended with goodbye. This conversation would turn out to be the last time I ever spoke to my grandmother. Without you it never would have happened. There may not be many things in life I am certain of, but this is one of them. Who knows why? If I hadn’t been at your show, if I hadn’t been really listening to you guys that night, then I wouldn’t have had that last conversation. All of this is a round about way of saying thank you. Really and truly, from the bottom of my heart, thank you. My grandmother was one of the most important people in my life and thanks to you, although I didn’t know it at the time, we got to say goodbye. I am ready for my final symphony. I am ready to rest in your arms. But there was no sound, there was no sound. They carried me home, carried me home. I’d also like to express my thanks to you for the comfort your songs provided me with over the crazy days that followed. Music means different things to different people at different times in their lives. What I needed that horrible May in 2005, was Tourist. I used that album to effectively drown out the worst of the grief and focus instead on memories, something I fear I would have been unable to do without your songs. So, there you have it. My thank you. I hope you enjoyed the show last night in Glasgow. I can’t decide which I enjoyed most: your conversation with the fan who travelled THROUGH BIG SNOW TO SEE YAS or the part where the audience wouldn’t stop singing long enough to let you sing your own songs. It was an excellent set. It was the sixth time I’ve seen you live and every time gets better. So, thank you for that as well. Thank you for stopping to talk to me. I really did enjoy our chat last night even though I bolloxed my story. Thanks for the hug, too, I hope you didn’t catch my frostbite! I’m looking forward to the next time you come to Glasgow, maybe by that time I’ll have mastered the art of conversation. Or maybe even just “hello”. 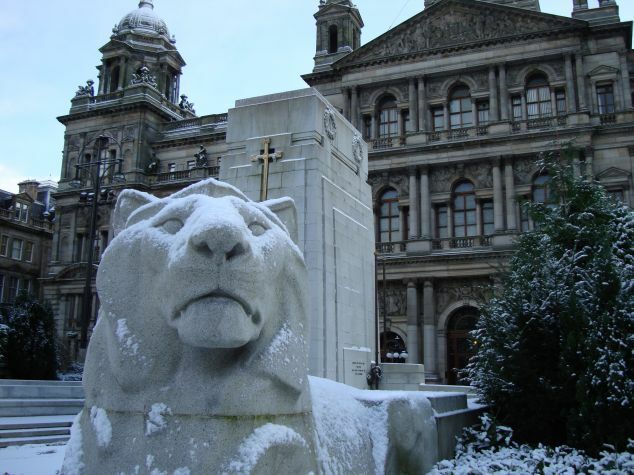 I love Glasgow in the winter when it snows. the only thing that we share is the same sky. 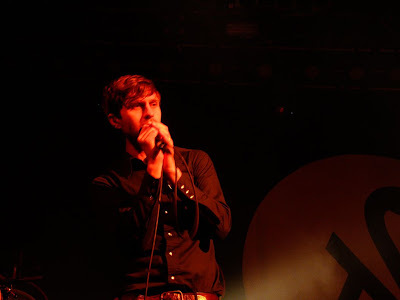 Laura, Angela and I went to King Tut’s last night to see Bell X1. I can’t remember for the life of me when I first heard them, but I know it was circa 2004/2005. 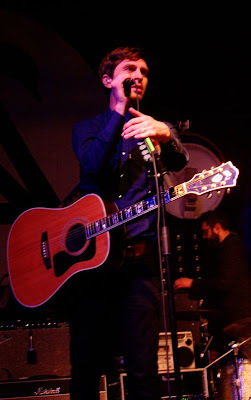 Their earlier incarnation as Juniper included a young Damien Rice before his solo years. The first album of theirs that I owned was Music in Mouth released in 2003, but their next album, Flock, is apparently “highly acclaimed”. Even though I own it I must admit that I haven’t given it the credit I should. Which is because I am busy listening to songs off Music in Mouth! Their latest album, titled Blue Lights on the Runway has come out to much anticipation and I am eager to get my hands on a copy – the songs they played off it last night promise an intriguing break from what I would consider their “norm” and I am happily looking forward to falling in love with them as heartily as those from Music and Flock. is maybe there’s no ladders in this game at all. Seeing them play live is something else! Laura, Angela and I went to see them a few years ago when they played the Garage in Glasgow, and when we arrived they were already playing our favorite song, Eve, the Apple of My Eye, and we were very excited. Except that by some twist of fate and stage times, it was actually already the encore and we had missed the entire show. I am happy to report that we arrived at King Tut’s not only on time – but early enough to hear one or two songs by the opening band as well!!! Way to go us!! Anyway, the point of my post is that they were amazing and we had a great time. The lead singer, Paul Noonan, was spot-on. The rest of the musicians were ace and the entire gig was amazing. 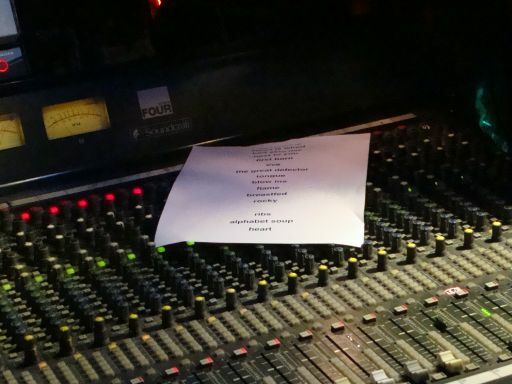 They played a lot of new stuff, which, as I said above, sounded promising and they played a big handful of old favorites so they really covered everything. If you get a chance, check them out. If you’re looking for song suggestions get in touch with me because I can recommend some excellent tunes. 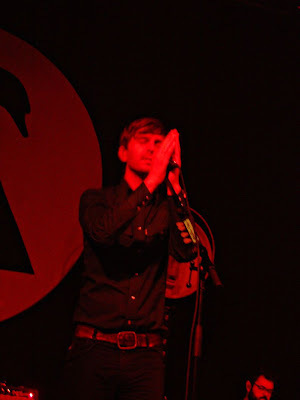 My next piece on Bell X1 will be dealing with their strong inclination towards religious allegory. What’s with the angel and what’s with the devil? They keep swapping shoulders and I can’t tell which from which. Said one to the other, but I think they’re only showing off. I have been to the theatre once in the past 5 years. I used to go all the time. We were members of the Great Lakes Theatre Festival and we went every few months to see a play downtown. Chekhov, Shakespeare, Sondheim, Williams. And every year The Christmas Carol by Charles Dickens. Not to mention the Cleveland Orchestra’s Christmas Concert at Severance Hall. And I miss it. Terribly. So I thought I would take a look at what Glasgow has to offer in the way of Holiday Theatre this year. 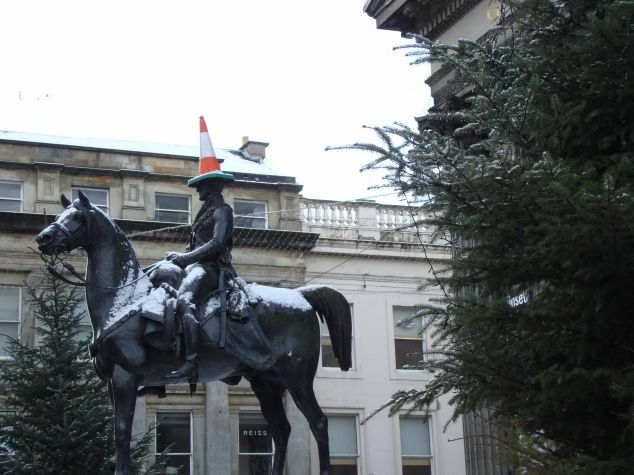 Considering how culturally enhanced Glasgow wants you to think it is, the choice is rather lacking. I can see any one of about 50 Christmas Pantos (horrid things aimed mainly at children, their adults, and people with less than 7 brain cells) which I have no desire to do at all, or I can wait until February when the ballet is showing The Nutcracker. Why in February? I have no idea. No idea in the slightest. Is it really possible that I am so strapped for choices when living in the largest city in Scotland and the third largest in the whole of the UK? Yes, it would seem so. I guess I am just unwilling to take a break from the familiar. The Royal Scottish National Orchestra does have a Christmas Concert, but it focuses on The Snowman, which is apparently a “magical family film” which is played in full accompanied by live narration and music. How thrilling. 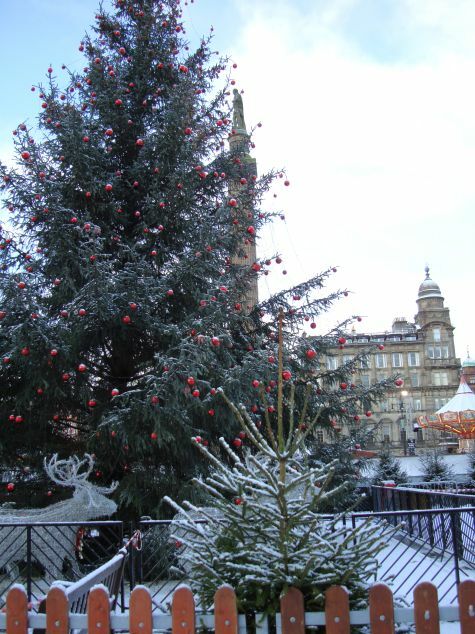 The Glasgow Chamber Orchestra is also playing a Christmas Concert, just the one, tomorrow. The choir that is singing is the Glasgow Hospitals’ Choir and, while all proceeds go to sick children in Glasgow, it is just too depressing for me. I could fly down to London for the day and see what sort of festive offerings they have for me. I would have my fingers crossed for The Christmas Carol, but that doesn’t seem to be so popular here. Or I could sit at home in a dark room with my eyes closed, playing a CD of the Cleveland Orchestra’s Christmas music which we bought many, many years ago and I could just pretend I am at a concert. And, while I am at it, what does a girl have to do to see a live theatre production of a Shakespeare play? Travel to the Globe Theatre in London? Or wait for the spring when the “narrative ballet” version comes to the Theatre Royal? Seriously. On the plus side, The King’s Theatre in Edinburgh is showing a version of Waiting for Godot by Samuel Beckett in April staring Gandalf and Captain Jean-Luc Picard (Ian McKellen and Patrick Stewart) for which I have already booked my tickets. For the first night just in case I NEED to see it again. And again. Masterpiece of modern theatre? I fear that may be an understatement. Bring on the Christmas season. And for pete’s sake someone please bring me some culture!